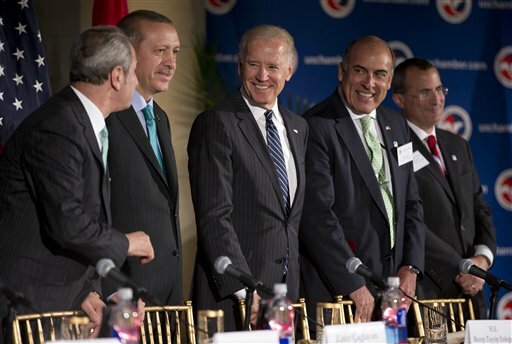 WASHINGTON, D.C.—The U.S. Chamber of Commerce hosted Vice President Joseph R. Biden Jr. and Turkish Prime Minister Recep Tayyip Erdogan today for a meeting of American and Turkish government and business leaders to discuss ways to improve the commercial relationship between the United States and Turkey. The event also marked the launch of the Chamber’s U.S.-Turkey Business Council. The U.S.-Turkey Business Council (USTBC) will serve as the leading trade and investment advocacy organization representing top American companies conducting business with Turkey. The Council consists of senior executives of U.S. companies from business sectors that are major investors in Turkey. The Coca-Cola Company will serve as Chair of the USTBC. International trade and investment is a key component of the Chamber’s 2013 American Jobs and Growth Agenda, an ambitious plan to generate stronger economic growth, create jobs, and expand opportunity for all Americans. The U.S. Chamber of Commerce is the world’s largest business federation representing the interests of more than 3 million businesses of all sizes, sectors, and regions, as well as state and local chambers and industry associations. Its International Affairs division includes more than 50 regional and policy experts and 12 country-specific business councils and initiatives. The U.S. Chamber also works closely with 116 American Chambers of Commerce abroad.